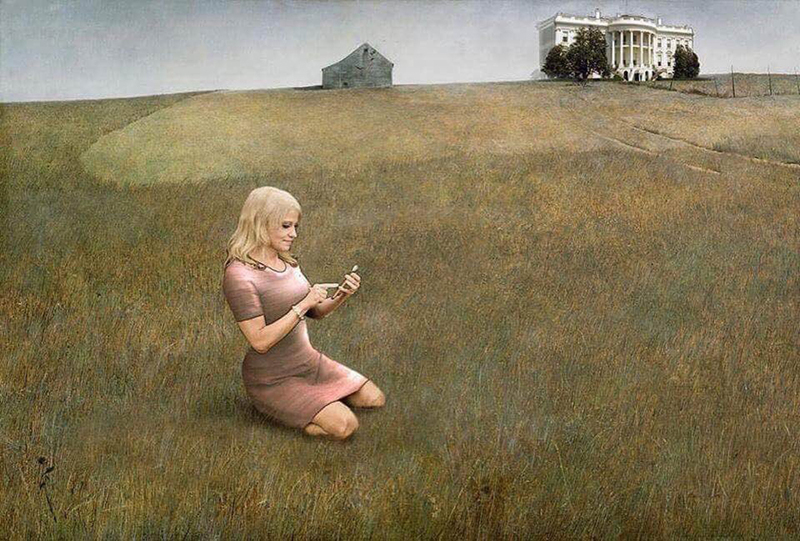 Brilliantly, artist Tim O’Brien saw the opportunity to insert White House spokes-skank into Andrew Wyeth’s famous 1948 painting “Christina’s World” after the image emerged of her indecorously perching atop a sofa in the Oval Office (it’s not as if they wouldn’t have had stick of furniture in the White House reupholstered, irradiated or burned like the Velveteen Rabbit anyway after Dear Leader moves out) with her shoes on and sitting like a toddler watching cartoons, uploading a picture she’d just taken a photograph of Dear Leader flanked by leaders of historically African-American colleges and universities. The subject of the original, Anna Christina Olson, is captured crawling in a field a distance from home in a fugue state, suffering from an undiagnosed debilitating neuropathy. The juxtaposition in the painting and the original scene is jarring, with the later (check it out at the link up top if you have not seen it) begging the question of how many ways can one be condescending and dismissive and indeed racist without donning a white hood.